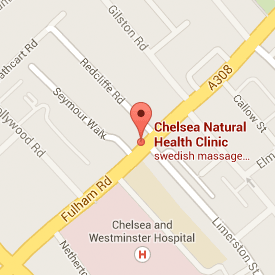 at Chelsea Natura Health Clinic, 208 Fulham Road, Sw10. Pregnancy Thai Yoga Massage is a wonderful type of massage that can be experienced safely and happily throughout pregnancy. It utilises massage techniques along with acupressure, reflexology and yoga methods to help the body and mind relax and improve the natural flow of energy. This helps to remove blockages and allow a free flow of energy which places the body back into balance thereby improving health and healing. Pregnancy Thai Yoga Massage can help reduce water retention, especially around the feet and ankles and improves the blood circulation. It can also safely support the inducement of an overdue baby. Thai yoga massage is great at relieving the lower back of all those aches and pains associated with the weight of carrying the little one(s) and is very effective at relieving sciatica and leg tension. At the end of the massage a serene sense of calm and and yet revitalisation are shared by both mother and baby. Thai Yoga Massage works to stimulate, open and balance the flow of energy through the Sen lines to assist the body in its natural tendency towards self healing. The massage works by using rhythmic manipulation, passive stretches, mobilization of joints and applied yoga. Thai yoga massage is practised on the floor and you will need to wear loose, comfortable clothing. This form of massage is highly beneficial particularly for anyone suffering from circulatory problems, lack of joint mobility, muscular stiffness and stress. Adriana is a Registered Reflexologist, Acupressure Therapist, Indian Head Massage Therapist and Thai Yoga Massage Therapist. She has worked as a holistic health practitioner for 8 years with therapeutic experience in various environments, from Central London clinics as: Relax in Picadilly Circus; Reflexions in Chelsea and Bayswater; Panakeia in Sloane Square, to different offices as theWarner Brother Studio, McCann Erickson, Bell Pottinger, Lewis SilkIn, Defra, Greenlight Research, IPG, Momentum, KBH Media. After gaining a Master’s Degree in Molecular Biology and working as a teacher and biology researcher for four years, in her mid twenties Adriana was first introduced to the Complementary Medicine way of thinking. She then decided to approach life from a different perspective, a more humanistic one. This, combined with a strong will to join the alternative healthcare field, led her to Peterson School of Reflexology, where she studied Reflexology for two years. From then on, her training uniquely blended Western and Eastern medicine and included extensive hands-on teaching. She then continued with courses in various kinds of massage, starting with the pressure points (Touch Pro), then the Indian head massage and with the Thai yoga massage (Howard Evans Therapy). Through each one of these types of massage Adriana has learnt different knowledge in working with the body, in opening, freeing and balancing the body’s channels of energy and life. CHAIR MASSAGE: is an effective form of massage, which is done through clothing, on a specially designed portable chair, which is quick and easy to set up. The treatment covers head, neck, shoulders, back, arms and hands and may be adapted to special needs. The advantage of this massage over the conventional massage is that leaves you feeling awake and alert to carry on with your daily activities yet totally relaxed and rejuvenated. REFLEXOLOGY: works on acupressure points on feet and hands in order to stimulate the bodyâ€™s own healing and balancing system. INDIAN HEAD MASSAGE: involves a gentle, soothing and rhythmical massage of the neck, shoulders, scalp and face helping to relieve headaches, eye strain and tension. THAI YOGA MASSAGE: works to stimulate, open and balance the flow of energy through the Sen lines to assist the body in its natural tendency towards self healing. The massage works by using rhythmic manipulation, passive stretches, mobilization of joints and applied yoga. Thai yoga massage is practised on the floor and you will need to wear loose, comfortable clothing. This form of massage is highly beneficial particularly for anyone suffering from circulatory problems, lack of joint mobility, muscular stiffness and stress.